These oven roasted vegetables will blow you away. Oven baked potato wedges with rosemary is a side dish I know and love from my early childhood. But in my seemingly never-ending goal to make the easiest clean eating dinner possible, I adapted the recipe a bit. The result is a blueprint for simple and lean sheet pan dinners with roasted vegetables. Of course, you could use it also as a refined side dish for a festive meal. Cooking with heat from both above and below (roasting) is a no-brainer to make a delicious meal out of almost anything. If you’re looking for an easy, plant-based dinner ready in 30 minutes this is the ticket and cleanup is a breeze. Want to know the best part of it? As the peel stays put on the vegetables you save even more time in your clean eating kitchen. On top of that, you can reap the full benefit from the fiber and nutrients in veggie’s skin. So make sure to use organic vegetables for this recipe. Click through to learn more about the top 30 high fiber vegetables. Did I say already, that I absolutely love sheet pan dinners? Heads Up: If you want to keep potatoes’ and carrots’ original color instead of turning red, read my recipe instructions below closely. Preheat oven to 425 F/ 220 °C. In a large bowl, combine the oil, rosemary, salt, and pepper. Add potatoes and carrots to the rosemary oil mixture. leave out beets! 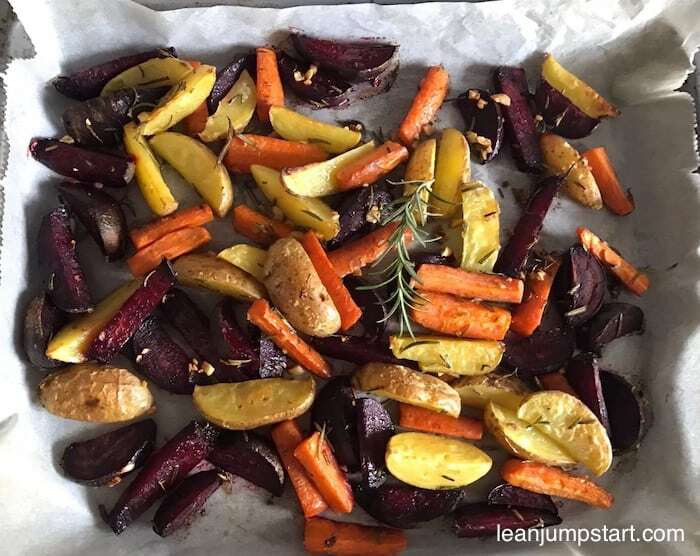 Arrange potatoes and carrots in a single layer on sheet pan. Add red beet chunks at last to the remaining rosemary oil mixture and toss. 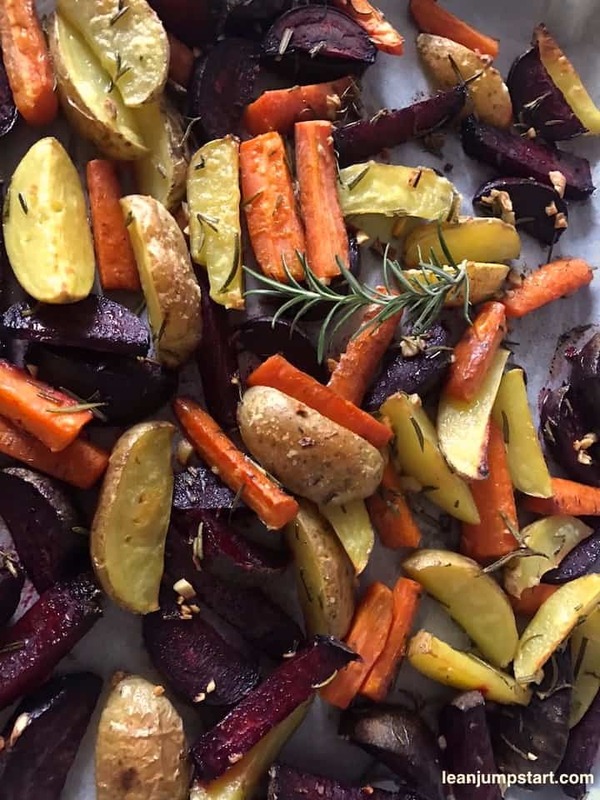 Add beets to potatoes and carrots on the sheet pan. Combined with a hummus dip and a green salad you have a perfect meal for weight management. 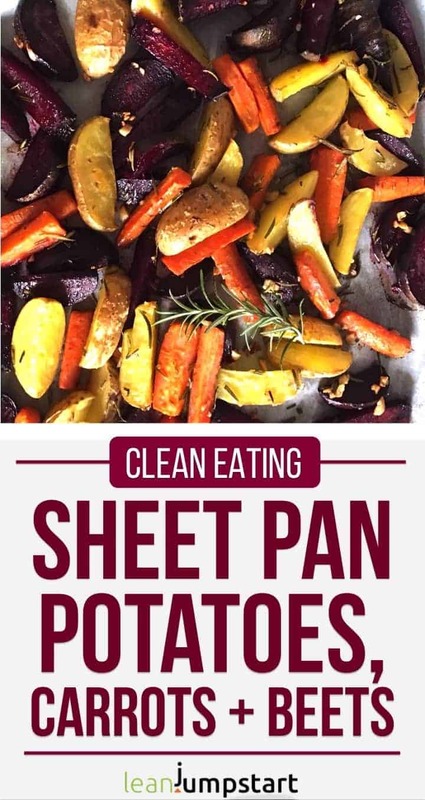 Sheet pan potatoes, carrots, and beets go also well with sour cream or homemade ketchup. You can set up healthy sheet pan dinners with almost any vegetable, allowing them to shine in all of their simplicity. These effortless dinners are easy enough to prepare in the morning and then pop in the oven when you come home. For best results make sure to combine vegetables with similar baking times or adjust sizes accordingly. Cut larger chunks for vegetables with shorter cooking time and thinner chunks for vegetables with longer cooking time. By the way on the web, you will find also many sheet pan recipes that include meat. No matter what ingredients you use there is less work that goes into the actual making of the meal. And as mentioned there’s significantly less cleanup with sheet pan dinners. Do you love the idea of simplified cooking? Teaching you simple cooking techniques that help you save time and money in your healthy and lean kitchen is an important part of my 52 Chef Habits Course. Click here to learn more!